Short movie day at the festival, because basically every movie I'd seen elsewhere - The Eyes of My Mother, Three, Karaoke Crazies, and The Wailing was scheduled for Monday, which was not convenient - you kind of lie them spread out, giving more of a chance to not make tough decisions. So I used the free space in the afternoon to go see the new Ghostbusters. It was pretty decent, if a little too fond of explaining details. I got back in plenty of time for White Coffin, although there were some weird technical issues, and the funny thing about a movie having its world premiere at a festival known for off-kilter films is that there's no way to tell whether the soundtrack is messed up or there are just some really odd choices being made so long as you can make out the dialogue and follow what's going on - and it could have been, because the director was doing screwy things like changing aspect ratios. That's what wound up happening, resulting in us seeing the rest of the movie by screener. Not ideal, but we got through. I do kind of wonder if the accidental weird soundtrack and the interruption affected my opinion of the movie; that's not how it's meant to be seen. 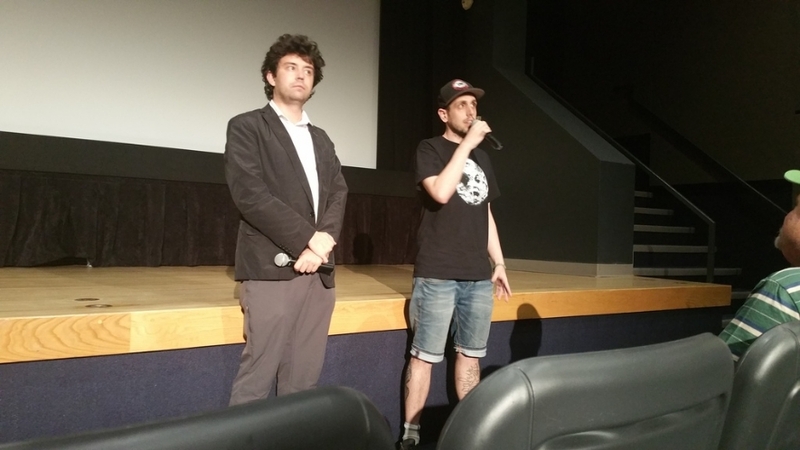 There's the Q&A for La Rage du Démon, with director Fabien Delage on the right, making the trip from France. I can't tell you a whole lot about what was said, because my French is terrible, but everyone seemed to be into it, and there were two more unusual French-language shorts afterward (that I won't try to review because my brain was fried). There was a lot of uncertainty on whether this would have subtitles or not, but I figured I could hang on for an hour, even if it was mostly a talking-heads faux-doc. There were titles, however, and I'm glad, because I wound up quite enjoying the movie. My initial reaction to "Madre de Dios" is that, while I may have hated director Gigi Saul Guerrero's previous short film, "El Gigante", at least that one had something resembling a story, compared to this one which is just an ugly scene of violence and mutilation not particularly attached to anything else. That's unfair; while this lacks exposition or much in the way of dialogue, it's not hard to figure out what's going on and maybe extrapolate a little more around it. I don't care, though. Guerrero and her crew can do some quality make-up, light things so that it comes across as dark but nothing is particularly out of sight, and step through what's going on with enough competence that a fragment of a story emerges and, because I'm not a monster and the cast and crew is capable of presenting the violence in a certain way, I feel a bit repulsed by a woman being stuck by knives. It still never feels like an actual movie, just a demonstration that these folks know how to use the tools. It's not engrossing, it doesn't have an interesting idea at the center, it doesn't even make me think that I'd like to see what she can do; it's just capably made ugliness that I don't get much from. I'm tempted to call the thing that makes White Coffin an incredibly frustrating horror movie "video-game writing", but I haven't played them in a while and I have friends who tell me its alternation of action with just enough dialogue to send the player off on another mission isn't exactly state of the art any more. Director Daniel de la Vega winds up having to make Adrián & Ramiro García Bogliano's script fly with sheer craft, and while he's got a fair amount of that, it can only get him so far. It opens with young mother Virginia (Julieta Cardanali) driving across Argentina with her daughter Rebeca (Fiorela Duranda), on the way to a new home, although a phone call from Rebeca's father indicates this may not be entirely within the terms of their custody arrangement. That may be moot; while eating at a rest stop, Rebeca disappears, as does one of a number of kids on a school trip. Virginia remembers a truck pulling out and chases after it, only to have an ambulance try to run her off the road. She hits a pretty dead end, but fortunately a mysterious man (Rafael Ferro) shows up to say that if a mother finds the White Coffin and brings it to a certain place then maybe she stands a chance - but not why. No, he'll just drive her a little way, get out of the car, and say she has to do this unexplained thing on her own for unexplained reasons. It devolves into a tremendously stupid game that involves keeping three women so ignorant as to require prompting phone calls and ready to turn on each other, facing mortal danger despite the fact that the whole thing doesn't make any sense if they don't get to the end relatively intact. It's one of those stupid horror movie plots where, even if you acknowledge that the goals of the villains make some sort of sense, this is a ridiculous way to go about it. Fabien Delage's La Rage du Démon ("Fury of the Demon" in English) is hardly unique for being a mock-documentary built in such a way that you could probably make a decent nonfiction film out of the material shot to supplant the main story, but that is a large part of its charm: There is genuine passion for all the material here, even the stuff that doesn't necessarily serve Delage's story. It is, ostensibly, the story about a screening at a Paris museum in 2012 of a Nineteenth-Century film recently unearthed by an American collector, quite possible a lost Méliès. It doesn't receive the rapturous reception that one might expect, though - the theater erupts into violence, the police have to be called, ten people are sent to the hospital. A little research suggests that this has happened both other times the film is known to have played (its 1897 premiere and a 1930s screening in New York). Did Georges Méliès, in many ways the most important filmmaker in history, film something unearthly enough to drive men mad? The answer, in real life, is no, and even within the film, Delage suggests that this demonic film may be more Méliès-adjacent than anything else. In doing so, he creates characters and a story that has the ring of period truth, tapping into how Méliès, who was a magician before he became a filmmaker, would have moved in the same circles as the spiritualists and others who fed the occult craze around the turn of the twentieth century. The stories of Victor Sicarius would be a worthy period piece on its own, and Delage does a fine job of not just fleshing it and its details out, but imagining the sort of record necessary that what we "learn" would be believably fragmentary, uncertain, and open to interpretation.